We've heard about this day probably more than we wanted to and if you are like me, you are so ready to leave the negative tv ads behind. 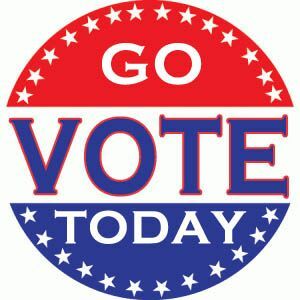 But alas, Election Day is upon us and I urge everyone, regardless of party choice, to exercise your right to vote. But this post isn't about voting, it’s about the awesome goodies you get AFTER you vote. I scoured the internet for you to pull together a list of all of the awesome freebies available after you vote. For most of these deals, you only need to wear your "I Voted" sticker. California Tortilla - Free taco at California Tortilla when you wear your “I Voted” sticker or say VOTE to the cashier on November 6. No purchase necessary. Einstein Bros Bagels - Free bagel & schmear at Einstein Bros Bagels on November 6 when you wear your “I Voted” sticker. Jet Blue – Enter for a chance to win a free flight from Jet Blue out of the country if your candidate loses (this is hilarious). D.C. Area Specific: Lululemon – Free yoga classes on November 6 throughout Washington, D.C., Maryland and Virginia. Check out Lululemon's blog for more information. D.C. Area Specific: Z-Burger – Wear your "I Voted" sticker to the Z-Burger locations in Tenleytown, Southwest and 14th Street on November 6 to get a free burger or cheeseburger. I am still in line and will definitely be hitting up Einstein bagels after this! My husband tried to get a free bracelet at Starbucks and they just looked at him funny! He was embarrassed. Ohh yay! I didn't even know election day freebies existed!! Yeah girl! In 2008, I got a free coffee and a free Ben & Jerry's ice cream. I was hoping for the same this year. But oh well, still some good stuff available. Newest follower here, I love your blog! Thanks for following me! And I will definitely check out your Shabby Apple giveaway!